Our Dunbar home is fully equipped, including wireless internet, laundry and plenty of space to lounge about inside and outside. Centrally located in a great neighborhood, 15 minutes from the airport, 15 minutes to downtown or Granville Island, 10 minutes to the local beaches, and 5 minutes from the largest park in the city (Pacific Spirit Park). Public transit is one block away and a convenient option to get around the City. Upstairs, we have four bedrooms and two bathrooms. The master bedroom has an ensuite bathroom and walk-in closet. The other three bedrooms share a bathroom. High ceilings and skylights in the common areas provide plenty of space and natural light. On the main floor, there is an open family room and fully equipped kitchen with new appliances. In addition, there is a dining room, living room, den and washroom. A desktop computer and wireless printer are provided for your use. Feel free to bring a laptop/ tablet/ smartphone if you wish to use the wireless connectivity. Free local telephone calls. On the lower floor is a theater room with large tv screen and surround sound to watch sports and movies etc. Full laundry facilities are also conveniently located. Our South facing backyard enjoys sun throughout the day. The deck is partly shaded with a large Dogwood tree beside the house. Lounge on an easy chair and watch the kids play on the lawn. Enjoy the privacy created by mature plants and rose bushes surrounding our property. There are a couple of wonderful parks a few blocks away. One block away there is also an elementary school, which has a playground, slides, swings etc. Great shopping is about ten minutes walk from home. You can pick up your groceries at the neighbourhood market and enjoy window shopping on the way back home. There are also a number of cute little coffee houses, to sit back and read the morning paper with your favourite brew. A walk or short drive will get you to Kerrisdale and Oakridge Mall for additional shopping. Some of Vancouver’s best restaurants are mere minutes from home. To work up an appetite, jog through Pacific Spirit Park, wander along Kitsilano Beach, or play a round of golf at one of a number of courses close by. Vandusen Botanical Gardens, UBC Museum of Anthropology and Science World are all great outings for those visiting Vancouver. Families with children will find our home roomy and functional. Adults without kids will enjoy the peace and tranquility of our spacious home and wonderful neighbourhood. Please read through our guestbook below. We have had many happy guests over the years. Two parking spots in the rear. Plenty of street parking in front. A large deck looks out on the back yard. Plenty of space for patio furniture and gas BBQ, and to relax after a busy day exploring Vancouver. We rented this house for one week at the end of August. There were 6 of us staying in the house (grandparents, parents, kids). It suited us perfectly...big kitchen, big dining table, and a big backyard. Off street parking was also very nice. Only a few blocks to Dunbar which has restaurants, groceries, banks etc. Neil was extremely responsive to a problem with the dishwasher which was resolved very quickly. I would definitely rent this property again. This was our second time staying in this home. It’s a roomy well equipped home with a lovely back yard. Perfect for our small family reunion. 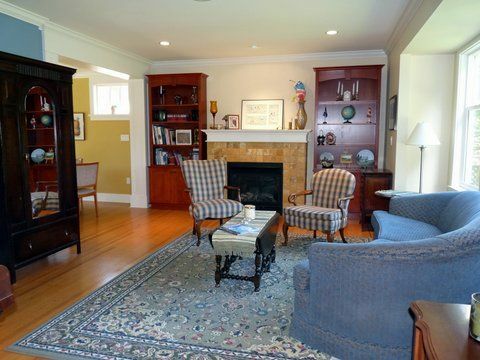 Location is great- neighborhood is quiet and Dunbar shopping neighborhood is walking distance. And Neil is very responsive to any questions or concerns. We highly recommend this rental! We stayed on August 2018, with a family of 8. Part of our choice was the proximity to UBC. The location was super good, just a 10 min ride to UBC where some of us were attending a conference, alternatively one could take the bus #25 with a stop less than 100 m away but we didn't try. We also liked the close location of businesses and several restaurants nearby, on Dunbar Street. The house itself is a wonderful place. It kept all promises and the owner responded swiftly on some question. We enjoyed our stay very much and would like to thank Neil for his hospitality! This home was comfortable -- in a safe and lovely neighborhood. The backyard is quiet and has an enjoyable outdoor space. Unfortunately, the front of the house faces a thoroughfare street, so the noise from traffic was not ideal when windows are open in warmer months. Great kitchen with new updates. Our sons enjoyed the downstairs TV area. Public transport was very easy, but it will take a good 45 minutes to reach downtown Vancouver, BC. The owner was a perfect host with regards to checking up on us and providing us all of the information before our arrival. It was also reassuring that we had contact information of his neighbor who is familiar with the house as well. The house is situated on quiet neighborhood with easy bus access to the rest of the city. Within a 5-10 minute drive from the house are grocery and drug stores and a diverse selection of cool restaurants and pubs. A special plus for us was its proximity to UBC (about 10 minutes) which we had to visit a number of times during our stay. The house itself was organized, well kept, and huge with many extra amenities such as a BBQ grill (which we didn't use due to the abundance of great restaurants nearby) and washer and dryer facilities in the basement which could accessed from the center of the house. A special touch as the laundry chute from the 2nd floor bathroom to the basement which we found really convenient. We also appreciated the convenient parking space steps away from the back of the house which eliminated the need for street parking. All in all it was a great stay and the owner helped make our first house rental a very pleasant and stress free experience. The Dunbar neighbourhood is a wonderful, quiet community within the City of Vancouver. This upscale neighbourhood is perfectly situated for exploring all Vancouver has to offer, and enjoying a relaxing evening at home. Walk through Southlands, with all the horses, stables and pathways along the Fraser River. Explore one of the many beaches just a few minutes away, with amazing views of the Harbour, City and Mountains. Wander Broadway or 4th Avenue, discovering quaint shops, and delicious bakeries and restaurants. Spend a few hours at Granville Island, picking up some interesting items from local artisans, and be sure to bring home fresh fish and produce from the Market. Checkin 4 pm, checkout 11 am. Saturday to Saturday bookings.